The EnsLib.FTP.InboundAdapter enables InterSystems IRIS to receive files via the FTP protocol. The adapter receives FTP input from the configured location, reads the input, and sends the input as a stream to the associated business service. 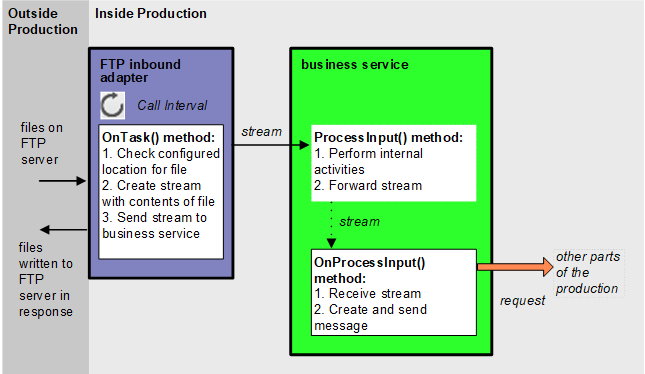 The business service, which you create and configure, uses this stream and communicates with the rest of the production. Call a suitable method of the business service to send the request to some destination within the production. Specifically, call SendRequestSync(), SendRequestAsync(), or (less common) SendDeferredResponse(). For details, see “Sending Request Messages” in Developing Productions.